Aimée Wilder, a designer based in Williamsburg, Brooklyn. Her works cover over typography, logo design, illustration, textiles and more. Now her designs have stood on Griffin’s iPod touch case. 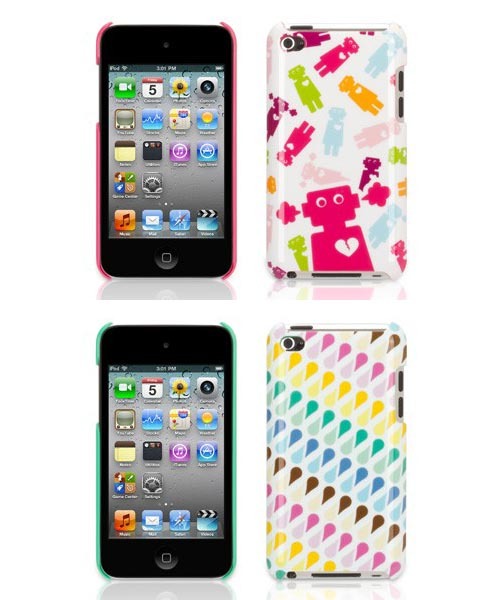 As we can see from the images, the each protective case features fascinating original design from the famous female artist to show your love to art, while the solid polycarbonate construction effectively protect the iPod touch 4G from bumps and scratches. And the snap-on design allows you to apply the hardshell case to your device with ease. Apart from that, the iPod touch 4G’s buttons and functions are accessible via custom cutouts. Griffin Aimée Wilder iPod touch 4G case is available in 2 types according to different designs. Each one is priced at $34.99 USD. If you’re interested, jump to Griffin official site for more details. Additionally, if you need more options, you might like to check Reflex iPod touch case and more via “iPod touch” tag.